Apple has officially releases its latest iOS 6.1.4 (Build 10B329) IPSW Firmware for iPhone 5 (GSM/CDMA) Smartphone devices which contains minor bug fixes, software-hardware improvements and major Update in Audio Profile for Speakerphone specifically for sixth-generation Apple iPhone 5 smartphone. Currently Apple iOS 6.1.4 (Build 10B329) Final Firmware is only available for iPhone 5 and its not available for any other iDevices including; iPhone 4S, iPhone 4, iPhone 3GS, iPad 4, iPad 3, iPad 2, iPad Mini, iPod 5G Touch and iPod 4G Touch device. If you're using an Apple iPhone 5 (GSM/CDMA) smartphone than you can Download Apple iOS 6.1.4 IPSW Firmware (Build 10B329) for iPhone 5 via Direct Links available below and you can install it via iTunes software on Mac and Windows operating systems. Apple iOS 6.1.4 IPSW Firmware for iPhone 5 is also available on iOS Dev Center website for iDevice users and developers having Apple Account and iDevice users can also Download and Install iOS 6.1.4 (Build 10B329) Firmware through OTA (Over-the-Air) Automatic Wireless Process by simply going to Settings > General > Software Update options into iPhone 5 smartphone. The approx. 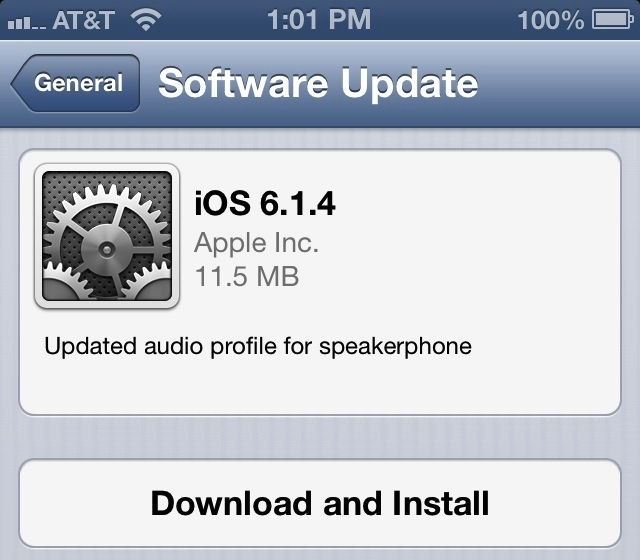 file size of iOS 6.1.4 Firmware (Final Version) is 11.5 MB via OTA. Apple device users can also Update/Upgrade Old iOS Firmwares to Latest iOS 6.1.4 Final Firmware through Manual process using iTunes. Currently there's no working Jailbreak Tool available to Unlock and Untethered Jailbreak Apple iOS 6.1.4 Official Firmware on iPhone, iPad & iPod Touch. "Team Evad3rs" is working for the release of Evasi0n iOS 6.1.4 Jailbreak Tool. Apple iDevice users’ needs to wait further for the working Redsn0w or Evasi0n Jailbreak Tool update. Apple users can get Official Direct Download Links of Apple iOS 6.1.4 IPSW Firmware (Final Version) for iPhone 5 (GSM/CDMA) from below.